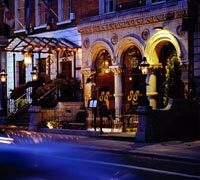 What began as The La Stampa Brasserie in 1990 is now one of the most luxurious boutique hotels in Dublin. Inspired by the orient this hotel is beautifully decorated offering the height of comfort and hospitability. Located in Dawson Street in the heart of Dublin’s City Centre guests will find that this hotel is the ideal base for shopping, exploring or attending business meetings. And for lovers the beautiful oriental décor and the lusciousness of the surroundings will make it a romantic weekend to remember. The La Stampa offers 29 magnificence rooms decorated and fitted to the highest international standards and guests will find themselves cosseted in the ultimate of four star luxury. Parisian bedspreads and beautiful crisp linen will ensure a night of pleasant dreams. The hotel offers five top quality suites and all guests can avail of the 24 hour room service delivered by highly trained and courteous staff. The rooms are equipped with every modern facility including mini bar, safe, television, 3 phones and broadband internet facilities. And the Mandala Spa will transport the guest through an expedition of pure bliss. La Stampa Brasserie is one of Irelands best known and most stunningly decorated restaurants. It offers modern European cuisine prepared to the highest global standards and can seat 200 people. Tiger Becs is an amazingly beautiful restaurant and offers exotic Thai cuisine. The head chef is a native Thai and takes the greatest care to make sure that the dishes from his native land are all lovingly prepared and served with pride. And The SamSara Café Bar is the hottest night spot in town but also the stunning Moroccan furnishings, hand painted décor and mystical palms make it the ultimate in mystery and romance. Located in Dawson Street just opposite the Mansion House the home of Dublin’s Lord Mayor the hotel is perfectly situated for visiting most of Dublin’s main shopping and tourists areas. Trinity College is just around the corner and visited every year by millions of guests who come to view the Book of kells and the famous Old Library. The well known Grafton Street is just a step away and slow leisurely shopping on a warm summer’s day is the perfect relaxation. Temple Bar is also just a step away and is adorned with beautiful cobblestone streets, quaint shops, wonderful pubs, restaurants and coffee shops.